I used to HATE rice pudding. Seriously - for years I called it "bug pudding" because I couldn't stand the texture. Granted, my experience was limited to those Kozy Shack rice pudding cups sold in my middle school cafeteria - but still, I was never impressed. Some 14-odd years later however, after seeing a recipe for Tres Leches rice pudding in the Smitten Kitchen's recipe book I decided to give it a try; after all, I'm always game for giving foods - desserts especially - a second chance. What I like about the original recipe is that it's creamy without being stodgy or glutinous, it isn't cloyingly sweet, and the rice retains it's texture without dissolving or disintegrating. But it was still a bit simple for me, so I decided to add some spice, some jam, and a nice sprinkle of black sesame (one of my greatest culinary loves) because as I've said before, I can't do anything simply. If you're not a fan of the texture of raspberry seeds, I'd recommend you strain your jam and leave out the sesame seeds altogether. And of course, a nice dollop of whipped cream on top never hurts. I chose to store my puddings in small mason jars not for the cute/hipster factor, but because they're air-tight and easier to keep/stack in the fridge (plus they're just what I had lying around). You can use anything though - cups, ramekins, even just spread out in one larger dish for a family style dessert - just slap some plastic wrap over it and you're good to go. It's a particularly enjoyable dessert in the hotter months; simple to make but it keeps well in the fridge, and makes a great addition to any barbecue or picnic. If you're having a particularly crazy week (like I've had) and need something easy and delicious, this is a good bet! * Unless you've found ripe raspberries at a local farmers market, always, always go with frozen (and preferably organic, as berries in general are one of the pesticide-heavier kinds of produce). The benefit to buying frozen is that the berries are picked and frozen at the peak of their ripeness, ensuring a superior product. Furthermore, freezing the berries breaks down the structures in their cell walls, meaning that you won't have to cook them as long as fresh berries to get a nice saucy consistency in your jam. ** As Deb points out in her book, you can skip the first rice-cooking step if you have two cups of cooked long grain rice in your fridge. If you have extra rice from take-out, this is an awesome time saver! 1. COMBINE your frozen raspberries, sugar, and lemon juice in a pot, and set over medium-low heat. 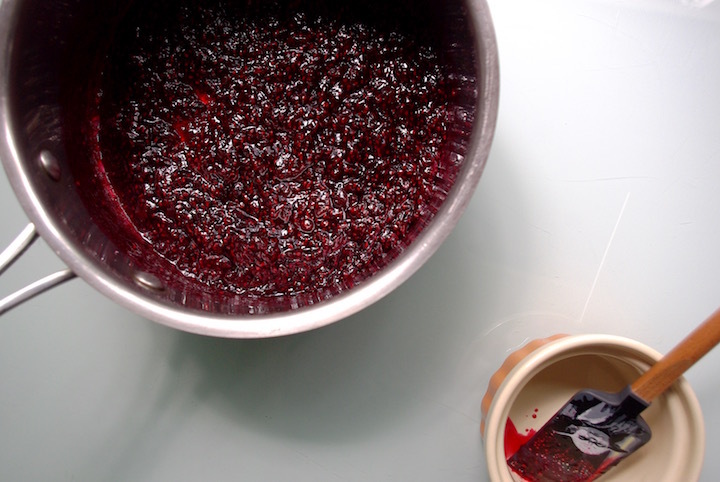 Give it a stir, and wait for it to boil - once it has, stir frequently, until the mixture has reached a consistency slightly looser than the jam you find in your store-bought jars (remember, the jam will congeal more as it cools, so don't over-reduce it). If you think you've reduced it too much, you can always just add a little bit of water and cook it back down until you've reached the desired consistency. Set aside to cool. 2. ADD your cup of rice to a pot with two cups of water. Bring this to a boil, cover the pot with a lid, and reduce your heat to low. Cook for 15 minutes. 3. WHISK together the egg and the evaporated milk. In a separate bowl, whisk together the condensed and coconut milk. 4. POUR the combined coconut and condensed milks in to your pot of rice, stirring until combined. 5. GRADUALLY stir in the combined evaporated milk and egg in to the pot of rice, stirring constantly so the egg doesn't cook. Stir in your vanilla and spices. 6. HEAT the pot over medium-low, and stir frequently until the rice has absorbed almost all the liquid. The pudding will continue to thicken as it cools, so don't let the rice absorb everything. 7. SPOON your pudding in to individual containers, cups, ramekins, or pour in to a large serving dish. Use a spoon or spatula to smooth out the surface. 8. 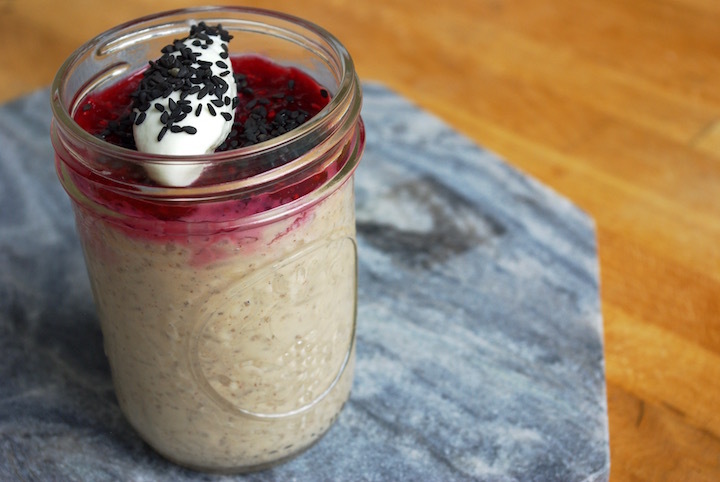 SPREAD your jam over the top of your rice pudding. Be warned - if you do this while the pudding is still warm, the jam will bleed a bit more in to the rice. If you want a nice clear line between the pudding and the jam, cool them separately, and combine once they've sat for a few hours. Due to the water content of the pudding, the jam will bleed into the rice after a few days no matter what, so if you're lazy/impatient like me, I just say combine them before cooling. 9. CHILL the puddings in the fridge for a minimum of three hours before eating. 10. TOAST your sesame seeds in an oven preheated to 300 degrees Fahrenheit, for 5-10 minutes. 11. WHIP your cream in to medium peaks, adding cinnamon if desired. 12. SPOON the whipped cream over your chilled puddings and sprinkle with sesame seeds before digging in.